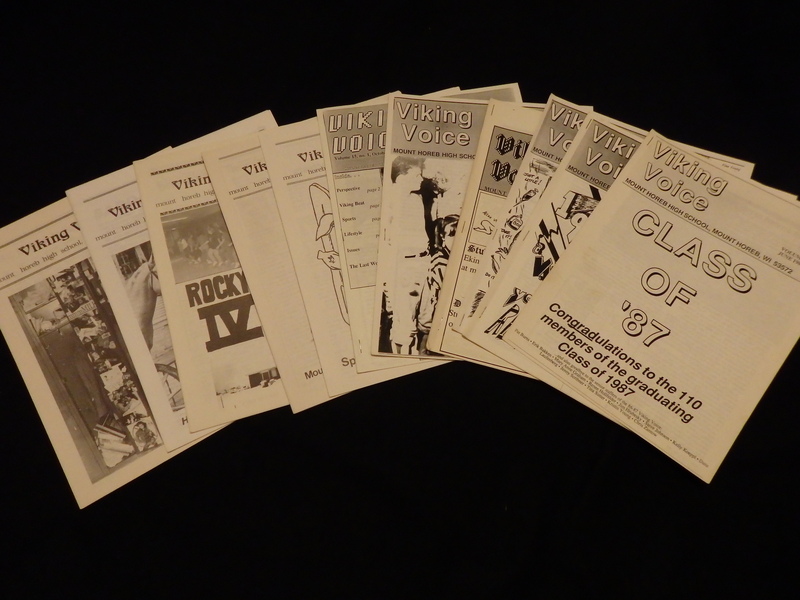 I was a journalism junkie growing up and a member of my high school newspaper (The Viking Voice in Mount Horeb). A few years ago I located all the issues our journalism class created during my Junior and Senior year. I then typed up the articles I wrote for the Voice, of course not knowing what I would ever do with them. Until now! 10:00 P.M. – Ahhh, bedtime. Boy, am I tired. I feel exactly like Rip Van Winkle. Well, I’ll just get comfortable and fall right asleep. 12:05 A.M. – I’ll try once again to fall asleep. Geez, it’s midnight! I’m starting to get worried. I need rest if I’m going to be active with my socialite friends tomorrow. 1:21 A.M. – Let’s see, I’ve counted 2,151,921 sheep, 956 anteaters, six goldfish, and two sleeping dogs. I think I’ll just hop out of bed and see what’s on the tube. Drat it! All of the channels are off the air! No, wait. Here’s one that’s still on. Wow, “3-D House of Instant Coffee” is on. What a lousy time to misplace my 3-D glasses. An opportunity to enjoy a fine cultural experience, and I mess up. I suppose I’ll go back to bed. 2:07 A.M. – Maybe a little food would help me get some shut eye. I’ll just take a short trip to the kitchen. Oops, sorry Spike. I hope mom won’t mind that I stepped on her cat. I never did like the stupid thing anyway. What’s in the fridge? Hmmm. Salad dressing, liver, whipped cream and tuna fish. Maybe I could make a liver split. Naw, I’ve got a better idea. I could market the tuna fish as deodorant. The smell would last up to five days, There’s only one problem: It’s too economical for me to make any money. 6:08 A.M. – I finally realized what insomnia is doing to my brain. I think I’ll take up elephant juggling, but first maybe I should go to sleep. I doubt if I will though. I’ve been awake all night already. It’s – zzzzzzzz, snore. I love the vintage look of those old papers. Cute story!